(CBS) - Looks like Mark Zuckerberg's profile isn't the biggest troll on Google+. 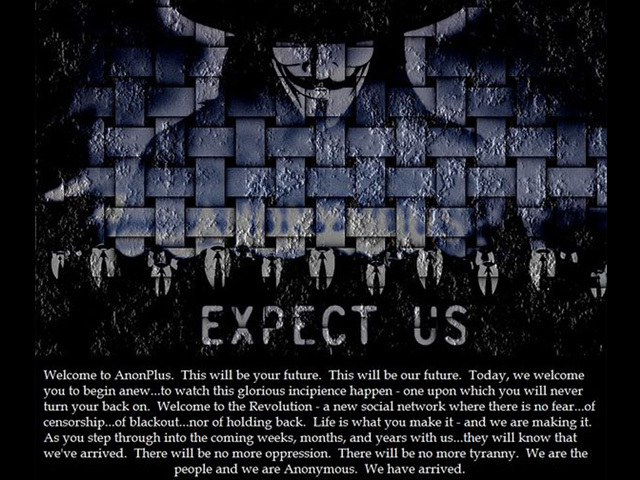 The Los Angeles Times reported that the hacker group, Anonymous, has been kicked off of the new social network. The controversial group also lost access to their other Google accounts, including their Gmail. The group's Tumblr blog posted a screen shot of the Google+ suspension notice for a profile named Your Anon News. The search engine giant only noted that Your Anon News violated the "Community Standards." In another blog post, Anonymous made this statement: "What we didn't know at the time is that we were just one of a [handful] of Anonymous accounts that was silenced." The group went on to announce their new project: "Not only did a few people organized an Operation [against] Google+, but we have started to build our own Social Network.... Welcome to AnonPlus." So what would a social networking site created by hackers look like? We're guessing empty profiles with thousands of different "V for Vendetta" masks. Currently, AnonPlus.com has this mission statement posted: "AnonPlus was meant to [thwart] government censorship - so that in the case of a government blackout - the people can still be heard." "This social network will also incorporate and facilitate an open source educational environment...allow open communication of ideas - and is essentially a cyber-anarchy formatted environment...allow open exchange of currency via alternative currency....This social network is essentially: The [activists'] dashboard," according to AnonPlus.com. Anonymous was born out of the popular image board site 4chan. The group and its spin-offs have gone on to hack the Central Intelligence Agency, Arizona Law Enforcement and most recently Rupert Murdoch's newspaper The Sun. Google+ was announced in June of 2011. The search engine recently reported over 10 million users have signed up for the service.